Artificial intelligence is all around us. As I shared in Content Creation Robots Are Here, billions of AI-created pieces of content are published yearly. What does this mean for humans who create content? Are you in danger of losing a job? Not quite. Despite the growth in artificial intelligence capabilities, the human content writer is needed more than ever. 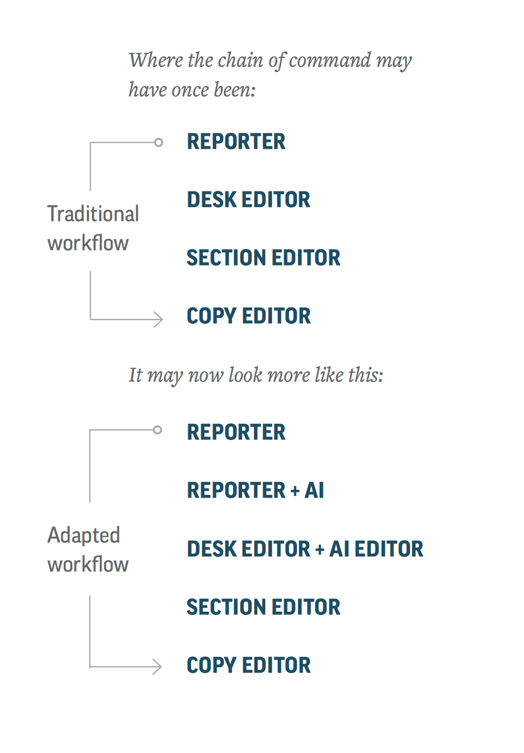 Robot content generation excels at drawing conclusions from large amounts of data, according to the Associated Press study The Future of Augmented Journalism: A Guide For Newsrooms in the Age of Smart Machines. Robot content generation excels at drawing conclusions from large amounts of data via @AssociatedPress study. Click To TweetThat’s why, since 2014, the AP has used algorithms to produce automated quarterly earnings reports. These short, objective pieces may lack any creative storyline beyond the raw data they lay out, but they allow AP to cover 12 times more businesses than they could with human creation. Reporters may spend less time transcribing and manually poring over datasets and instead spend that time making calls and pursuing leads derived from an AI analysis. The terrible tagline “a quick, coherent starting point for your articles” wasn’t a good sign, but I gave it a try. I entered the subject “content promotion” and clicked the pencil button. It took two minutes to “cook” the content piece, then presented me with a paywall. I paid $1.90 for the piece, but handed over $19 to the AI site because I had to buy a minimum of 10 articles. Content promotion is a subject in the promotion universe relating to publishing important messaging to a specific audience white papers will be an example of this. The problem does not put in their ambition to embark on content marketing strategy, the issues come from 3 common areas: the intricacy of the content advertising ecosystem, too little expertise or understanding with content marketing, as well as the technical measurement issues related to how audience consumes content across different devices today. “The reality is writing great content alone won’t get you far. Composing a high-quality piece and hitting “publish” just isn’t enough. You have to help it along on its internet journey. Hold its hand for a little bit. You have to guide it into the limelight, or, in some cases, shove it out there. It’s the only way to ensure success – as opposed to publishing it on your site, crossing your fingers, and hoping against hope somebody will stumble across it and read it. With solid promotion, you can help your blog reach great heights. The only question left, of course, is this: “How do I promote my blog?” I’m here with tons of actionable tips to help you do just that. Settle in with your cozy beverage of choice. I went into 15 actionable tips, tricks, and strategies. But the key was how I crafted the blog opening with a story that resonated with my readers. When I focus on writing an opener that gives a hook and is optimized for maximum creativity to hold the reader’s attention, the post usually receives 100% more shares than the average post on the site. This one received over 200 shares within a few hours of going live. HANDPICKED RELATED CONTENT: Will Artificial Intelligence Replace Manual Content Creation? Content marketers appreciate the need to build a connection with their audiences and that frequently requires emotional, subjective, and reader-centric content created with thought, care, and immense creativity. Content written by thought leaders has the power to influence followings and even create waves in the industry with powerful effects. 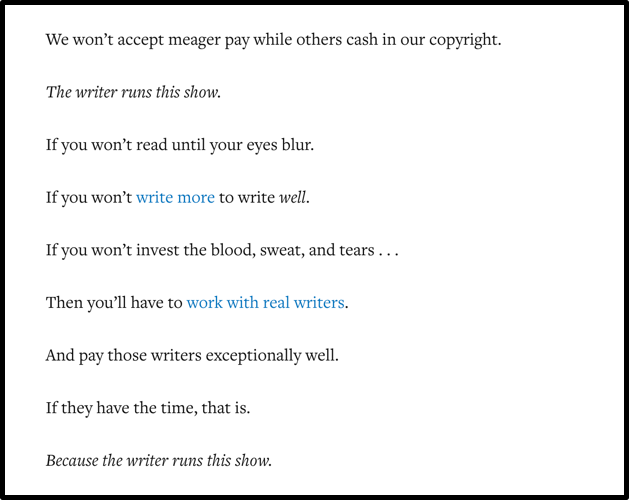 This pithy, poetic piece earned more than 700 shares and generated 83 comments. I took inspiration from Brian to create a piece for my own marketing called Dear Return Clients: Here’s Why We Can’t Accommodate Your Old Rates. Posted on my blog, this letter explained to clients who didn’t see our growth and quality increases as transparently as we did, why we (successfully) increased our rates. Brian’s writing was eloquent and emotion-stirring. But the know-like-and-trust factor, down to the familiar smile in his headshot, is a big reason behind the success of his and other influencers’ content. Readers recognize and relate to the influencer. 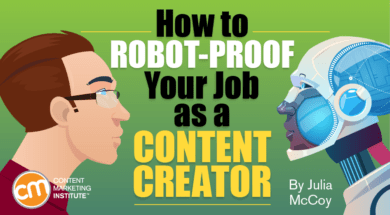 While a bot may be able to help an influential content creator, it’s unlikely to replace great writing skills coupled with a familiar human face. To stand out in a world of “content shock,” as Mark Schaefer describes it, human-based content is essential. In just 60 seconds, over 3.3 million Facebook posts go out, over 500 hours of video are uploaded to YouTube, and over 1,440 posts are published in WordPress. Valuable advice. A friendly voice. Useful content. A relevant viewpoint. Engaging writing. Happy stories. Relatable stories. Inspiring stories. Motivating stories. 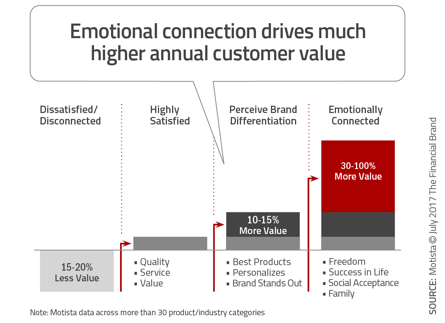 Studies, including one done by Motista, show the direct correlation between emotional connection and customer purchase spend. The higher the emotional connection, the higher the spend. Credit card use among the target audience group increased by 70%, and new account growth rose by 40%. The emotions behind the click and the connect are the same as those behind a person-to-person relationship. Storytelling in content marketing gives the user an “experience.” It’s in our nature to listen to stories, and be influenced to trust – or distrust – because of a story we were told. And those stories must be human – written by a human, for a human. Humans are the only way to bring the human element into the story. It seems that we can conclusively say that the human mind is able to relate to and absorb stories much better if there is a ‘human’ element in the story that is easy for the audience to imagine. The trick for content makers like myself is to find work that only content makers like myself can do – work where human qualities like experience, judgment, and creativity get rewarded. And if we can’t do that, we ought to be doing something else, anyway. Create content that solves your direct (human) readers’ problem. Anticipate their next steps. Let them know and feel you’re there with them. Here are a few ways you can do that. Quit focusing on the keyword and write for the person. For example, if you’re a writer and your longtail keyword is “how to write a blog,” interview two to three clients on their biggest questions on blogging. Post a poll to a Facebook group or on Twitter. Use the potential audience’s input to craft the blog – to answer their questions – and send it to them once it’s posted. In your human-created piece, you will have engaged content collaborators and readers to address your human audience’s biggest questions. Look for and involve your customers’ experiences. Mine live-chat history and support requests and study the wording, questions, and content your clients write and send to you. What are their common problems? What are their biggest questions? What language do they use when they explain their problem? Focus on one problem your clients face, and open your article with that. Write a scenario. Then, answer it. Think about those real people while you write, and think about writing in their voices. Creating a buyer or audience persona could help you identify, for example, their age group and subsequently the content voice. Millennials, for example, might open your emails more often if the headline includes emojis (according to a Harris Poll survey, they communicate more through emojis and GIFs than words). 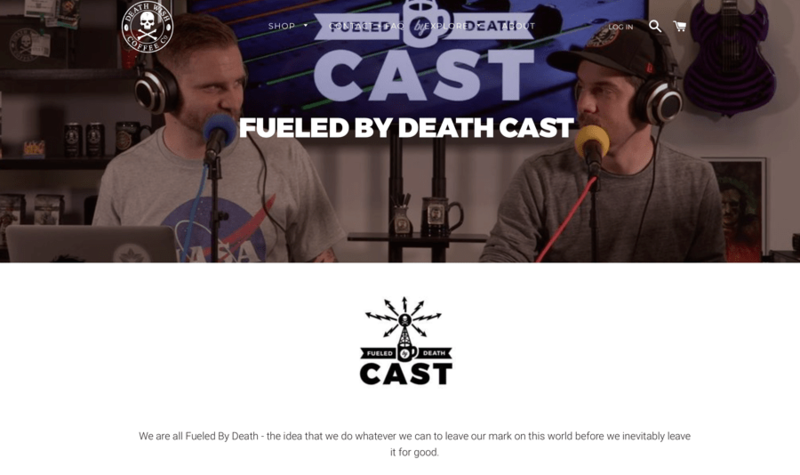 We are all Fueled By Death – the idea that we do whatever we can to leave our mark on this world before we inevitably leave it for good. Bottom line: If you want to outperform the robots, it’s time to go beyond a just-the-facts approach in your content. It’s time to have a creative, authentic, and real voice. Create content for your human reader. And if you strive for the human connection every time, you’ll never risk losing your place to a bot.